Peter Pauling with his dad, 1931. Before he passed away in 2003, Peter Pauling saw his daughter Sarah marry, and also witnessed the births of two grandsons, Isaac and Malachi. Over time, he likewise learned to recognize the ebb and flow of his manic and depressive phases, at points struggling to overcome insomnia and drinking too much whiskey or beer, and at others walking the country paths around the mill so giddy with delight, that he felt he could not contain his joy. In 1992, Jim Watson came to Wales to call on Peter and Alicia. Peter had recently seen a BBC drama depicting the discovery of DNA which, as he explained to his old friend, was not entirely accurate. When Watson asked what they had got wrong, Peter answered firmly that he had appeared only at the very end of the program, and that he showed up on screen driving a white Cadillac convertible. For a car man like Peter, being portrayed in such a vehicle was, apparently, an insult to his sense of personal pride. Though thousands of miles apart, Peter remained in regular contact with his father. In 1992, Linus called on his son to ask his advice about what he should do with a collection of secret documents stemming from his years of involvement in the American war effort. As he looked through his files, Linus Pauling had been unable to track down an apparently nonexistent Navy patent for a substance, named “Linusite,” that he helped to develop in secrecy in 1945. Similarly, he noted, his invention of the oxygen meter had presumably remained classified, as was a cone shell windmill that he designed in 1952. Indeed, Linus had a personal safe full of records relating to such top secret projects, and he had no idea which of them had been declassified. Now, at the age of 91, he wanted to unburden himself of these materials, one way or another. Wishing to help his dad out, Peter called a close friend of his from his undergraduate years at Caltech, Robert Madden, who was then working in the National Security Administration. The elder Pauling’s safe was subsequently inspected, and select material duly vanished into the hands of the federal government. Linus and Peter Pauling in England at a model of Bourton-on-the-water, 1948. Well, you did not play much baseball, but then neither did I. You did, however, lie on the side of my bed and taught me how to count in French. Later, when I was old enough to get out and about, you were often out to rescue me, either because I telephoned or Mamma was worried and sent you out to do a general search of the whole of Pasadena and surrounding environs. 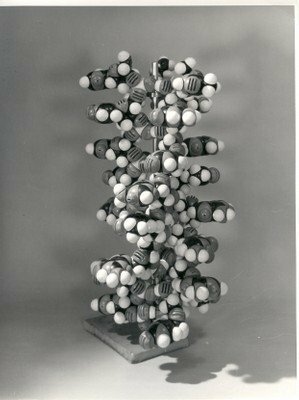 With Winter break coming fast and Linus Pauling having apparently solved the structure of DNA, Jim Watson and Francis Crick extinguished any hope of modeling their own structure. Eager to take advantage of a few days off, their Cavendish office mate, Peter Pauling, headed for the continent in the company of a friend whom he described as “a mad Rhodes scholar” who had “wooed” him with his “insane plan” for exploring Europe. On this trip, which was indeed ambitious, Peter visited Munich, Vienna, Linz, Brussels, Frankfurt, and Bavaria, hitchhiking his way from location to location. Crossing Germany, Peter saw neighborhoods still littered with the rubble of the Second World War, alongside industrious people struggling to rebuild. His mode of travel, he confessed to his mother in a letter, had seemed a better idea when its low cost was his only consideration. In person, however, spending several hours standing in or walking through the snow had a way of changing one’s priorities. I look out the window to the lovely white mountains. It is grand. Considering the possibilities, Christmas and your birthday [Ava Helen was born on December 24, 1903] could hardly have been spent in a nicer place. Considering impossibilities, I can think of places where I would much prefer to be. Sometimes it is sad to grow up. With the arrival of the new year, the Cavendish researchers put their skis away, shook the snow from their coats, and resumed their work. It wasn’t long into the term before Peter learned, from two letters received in February, that his father was, in fact, having difficulty with some of the van der Waals distances hypothesized to be near the center of his DNA model. In response – and almost as an afterthought – Peter casually asked his father for a manuscript of the DNA proposal, mentioning that his coworkers in Max Perutz’ unit would like to give it a read. Upon receiving the paper, Peter promptly revealed to Watson and Crick that the Pauling-Corey model was a triple helix, a concept similar to one that Watson and Crick had developed themselves – and rejected – back in 1951. This moment was a major turning point for Watson and Crick, who only then realized that they still had a chance to discover the structure before Linus Pauling. That said, what followed may not have been quite the race as it was made out to be after the fact. At least, Peter Pauling did not see it that way, and the casual manner in which his father interacted with him (and with others at the Cavendish) seems also to belie such a dramatization. Near the end of February 1953, while wishing his father a happy birthday, Peter noted that his office still felt that Linus’ structure required sodium to be located somewhere near the oxygens, whose negative charges would have to cancel out to hold the molecule together. “We agree that everything is a little tight,” he said, referring to the small atomic distances between Pauling’s three polynucleotide chains with phosphate groups in the middle. As communicated in an earlier letter to his son, Linus Pauling had already identified these structural arrangements as a weakness of the model, and he was in the midst of attempting to correct the issue. Peter confided to his father that, at that time, the Cambridge office had nothing better to offer. He added simply that “We were all excited about the nucleic acid structure,” and concluded with his many thanks for the paper. In response, Linus Pauling asked for updates on any progress that Watson and Crick were making with their own model, and casually requested that Peter also remind Watson that he should arrive for a scheduled protein conference at Caltech by September 20th. Peter clarified only that the Cavendish group had successfully built the Pauling-Corey model and that Watson and Crick had then discarded it, becoming very involved in their own efforts and “losing objectivity.” It would be up to them, Peter said, to communicate the details of their structure. Shortly thereafter, Watson and Crick sent a letter to Linus Pauling, outlining their structure and including the short article that they had submitted for publication in Nature. Crystallographic photo of Sodium Thymonucleate, Type B. “Photo 51.” Taken by Rosalind Franklin, May 1952. It has been well-established that Pauling and Corey made basic errors in their own modeling of the structure of DNA. But in March 1953, having no knowledge of the x-ray crystallographic photographs of DNA that had been taken by Rosalind Franklin at Kings College, Pauling felt bewildered by the certainty with which Watson and Crick had rejected his triple helical model. 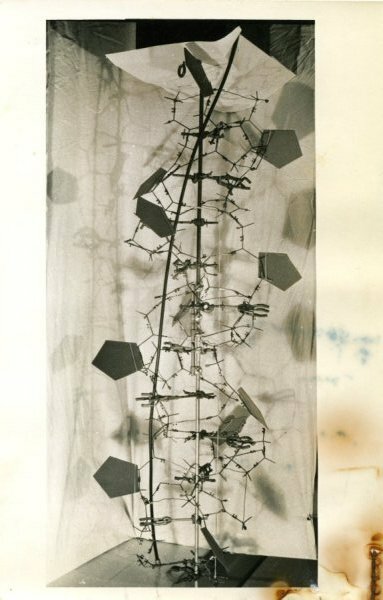 Upon learning its details, Pauling agreed that the double helix model was at least as likely, and he considered it to be a beautiful molecular structure, but he could not understand why his own structure was being ruled out entirely. At the heart of his confusion lay the fact that he did not believe that any x-ray evidence existed that proved that the phosphate groups might somehow be located on the outside, rather than in the core, of the DNA molecule. Pauling did not believe that this evidence existed because he hadn’t seen it yet; crucially, Watson and Crick had. Indeed, from the point of their realization that Pauling had modeled the structure incorrectly, Watson and Crick worked fervently to once again convince Maurice Wilkins to provide them with Rosalind Franklin’s data. Within a month’s time, and with Rosalind Franklin having left his lab, Wilkins finally consented to providing Watson and Crick with all of the relevant data that he had requested. This proved to be the final piece that the duo needed in building their correct structural model of DNA. Pauling en route to Europe, 1953. While all of this went on, Linus himself was seemingly unconcerned by any “race” for the structure of DNA. In fact, the only racing on his mind was a jaunt across Western Europe in a new sports car. While Watson and Crick frantically worked to unravel the secrets of DNA before Linus Pauling beat them to it, Linus Pauling himself was debating the virtues of British, German, and Italian motor vehicles. Preparing for multiple trips overseas and in the market for some new wheels, Pauling’s plan was to select a car while in Europe during the Spring for the Solvay Conference, and then to actually pick it up in August, when he and Ava Helen would return to Europe for the International Congress of Pure and Applied Chemistry in Stockholm and Uppsala. The couple would then tour the continent in style before returning to the United States on a Scandinavian freighter and driving across the country from either New York or New Orleans to their California home. A segment of the original Watson and Crick DNA model. 1953. As the end of March rolled around and the Solvay Conference approached, Linus Pauling alerted his son to the fact that he had not made hotel reservations or, really, any plans for his visit to Cambridge. This responsibility he delegated wholly to Peter, who was somewhat distracted at the time, writing to his father about the blue sky and sun that had finally begun to break up the English winter gloom, and announcing with pride that he had gone to two balls in one week, getting along quite well with the Scandinavian girls. “As a sensible young American, I stand out in this town of pansy Englishmen,” he declared with impunity. When the moment of truth finally came, Peter and his father strode into the Cavendish offices to see the model that Watson and Crick had constructed. Upon inspection, Linus reiterated the interpretation that he had given to his son earlier: the structure was certainly possible, but to be certain, Pauling would first need to see the quantitative measurements that Wilkins had provided. By way of response, Watson and Crick produced “Photo 51,” Rosalind Franklin’s now-famous image that enabled crucial measurements concerning the structure of the B-form of DNA. So was it a race? And if so, what was Peter Pauling’s role? Was he a double agent or an informant? Or merely an unwitting accomplice, ignorant of the full implications of his actions? The only person who could conceivably have been racing was Jim Watson. Maurice Wilkins has never raced anyone anywhere. Francis Crick likes to pitch his brains against difficult problems… For Jim, however…the gene was the only thing in life worth bothering about and the structure of DNA was the only real problem worth solving. In 1966, Jim Watson, then in the process of writing his book on the discovery of DNA, The Double Helix, sent Peter Pauling an early draft. His concern, he explained, was that he accurately portray Peter’s role in the entire affair; that, and he didn’t want Peter to sue him for defamation. Peter Pauling with his parents, ca. 1950s. Having said goodbye to the nightlife of Montreal, and having entrusted his brother Crellin with the needle to his old turntable, Peter took to the sea without much to his name save a bottle of duty free Canadian Rye Whiskey; which, he lamented, did not keep him as warm onboard the cold ship as a good overcoat might have done. (Ava Helen, ever concerned for her son’s well-being, would see to it that he would have money to pick up some warmer clothes once he had arrived in Cambridge, paid for in matured war bonds.) Onboard the ship, Peter shared his cramped cabin space with three roommates: a Scot, a “very pleasant and hard-working” Englishman, and an 18 year old “pipsqueak” just out of rugby. Ever the charismatic socialite, Peter must have been excited to spend his days at sea with such an assortment of characters. Arriving in England in the fall of 1952, Peter began his studies at Cambridge University, working under John Kendrew, a Peterhouse Fellow in Max Perutz’ Molecular Biology Unit at the Cavendish laboratory for physics. Although the Cavendish traditionally had not extended its focus beyond physics and physical chemistry to questions of biology, Sir Lawrence Bragg – director of the Cavendish and chair of the university’s Physics department – had recently supported an expansion of the lab’s scope to include the mapping of biological molecular structures. This new Molecular Biology Unit would spearhead several important discoveries, among them Kendrew’s and Perutz’ work on the atomic structure of proteins, the program of research that Peter was brought on to support and an accomplishment significant enough to garner the 1962 Nobel Prize in Chemistry. That same year, two other former Cavendish researchers – James Watson and Francis Crick – would receive their shared Nobel Prize in Physiology or Medicine for their discovery of the double helical structure of DNA, a breakthrough that Peter Pauling certainly observed from a front row seat, and even, perhaps, helped to make possible. Women aside, Peter was most concerned by the day-to-day troubles that were typical of English life in the early 1950s. He wrote to his mother about the lack of a bathtub in the small, cold, damp room that he now inhabited, and complained about the space’s perpetual lack of sunlight. He did praise his fortune at having scoured London and finding a suitable teapot, and he requested that Ava Helen kindly make him a pair of curtains for his window (which she happily obliged). In letters to his father, Peter preferred to talk about cars, or his recent dinners with the Braggs and their daughter Margaret, rather than his own research pursuits. Linus, on the other hand, was immediately curious about the intellectual climate at the Cavendish and was especially interested in the work of Francis Crick, who a year earlier had been part of a collaborative effort to develop a theory of mathematical representation for x-ray diffraction that was fast becoming a standard in the field. The previous year, 1951, Linus Pauling had bested Bragg and the physical chemists at Cambridge in becoming the first to publish the alpha helical structure of many proteins. Despite the desire prevailing at the Cavendish to eventually beat Linus Pauling at his own game, Watson and Crick had been warned to keep away from the study of DNA by the head of the lab. Bragg knew that Maurice Wilkins and Rosalind Franklin, of King’s College London, were already working on the problem using Franklin’s photos and crystallographic calculations of the A and B forms (low and high hydration levels, respectively) of DNA. While Watson and Crick urged Wilkins to provide them with Franklin’s images and calculations so that they might model the structure themselves, Peter stoked the fires of their urgency, assuring them that his father was no doubt only moments away from solving the problem. Donahue was equally convinced: for him, Linus Pauling was the only scientist likely to produce the right structure. By December, the fate that Jerry Donahue and Peter Pauling had been predicting seemed to come true: a letter from Linus to his son claimed that he had indeed determined the structure of DNA. 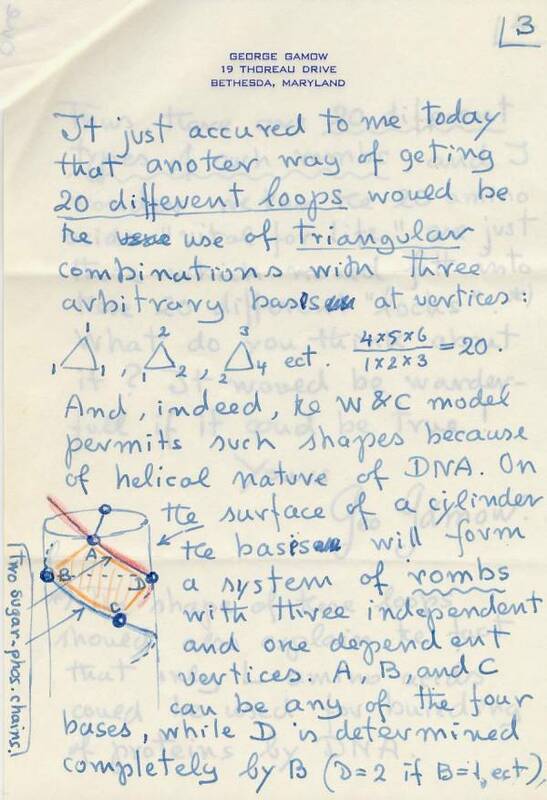 The letter gave no details, simply confirming for Watson and Crick that Pauling and his Caltech partner Robert Corey had somehow solved the problem. Watson later recounted his colleague’s distress in hearing this news, recalling that Crick “began pacing up and down the room thinking aloud, hoping that in a great intellectual fervor he could reconstruct what Linus might have done.” But it seemed to be too late. Pauling’s DNA paper was set to appear in the February 1953 issue of Proceedings of the National Academy of Sciences. In all likelihood, it would be time to move on to new projects. Alexander Rich. Photo by Donna Coveney. Today we remember Dr. Alexander Rich, a student and colleague of Linus Pauling who passed away in April at the age of 90. Rich and Pauling were among the group of scientists who embarked on one of the most exciting scientific quests of the 20th century – the so-called “race for DNA.” Rich’s friends and colleagues also remember him for his endless desire to know more about the processes propelling life, a trait that is evident in his career as a biochemist. According to Pauling, this holistic interest in and understanding of science allowed Rich to make invaluable contributions to multiple disciplines. Nucleic acids – the carriers of genetic information within a cell’s nucleus – were first identified in 1868 when Friedrich Miescher isolated the DNA compound for the first time. For some eighty-five years, however, the structure of DNA remained undescribed. In the 1940s and 1950s, scientists around the world began to focus more on the problem, working to build an accurate model of the DNA molecule in hopes of fully understanding its role in the process of gene expression. In 1953, using Rosalind Franklin’s experimental data, James Watson and Francis Crick published their proposal of a double helical structure for the DNA molecule, and quickly became scientific celebrities once their model was deemed correct. Like Rosalind Franklin and, indeed, Linus Pauling, Alexander Rich was among the many researchers whose work and contributions to the understanding of proteins and nucleic acids abetted Watson and Crick’s discovery of the DNA molecule’s structure. 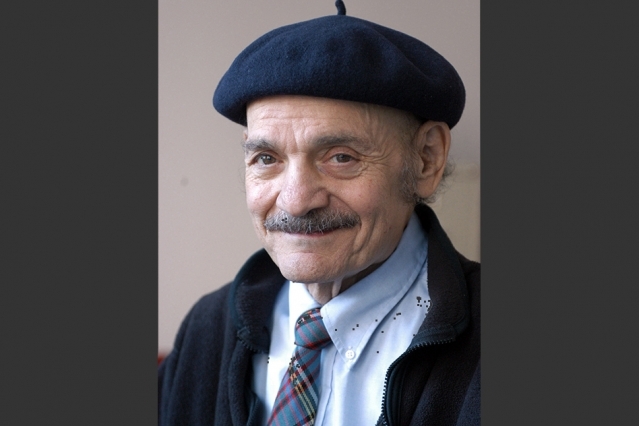 Born in Hartford, Connecticut in 1924, Alexander Rich served in the U.S. Navy during World War II, then went on to Harvard University, where he received a bachelor’s degree in biochemical sciences in 1947 and graduated from Harvard Medical School in 1949. Soon after receiving his medical degree, he moved to Pasadena, where he worked as a research fellow in Linus Pauling’s lab at the California Institute of Technology, and where he lived with future Nobel laureate Martin Karplus, a fellow student of Pauling’s. Blessed with a nimble mind, Rich was able to jump back and forth between chemistry and biology as his research interests progressed, all the while paying close attention to the broader implications of his research for the field of medicine. Rich became particularly well-known for his work on the structure and chemistry of fiber compounds, research which quickly became useful to the study of nucleic acids. By isolating strands of nucleic acids within fibrous compounds, Rich was able to produce images of their structure. Though his pictures were not as clear or impactful as those captured by Rosalind Franklin, many have since posited that his work could have been of equal significance to Franklin’s had Caltech housed more fine-focus x-ray equipment. Regardless, Rich was held in high esteem by Watson and Crick who, before publishing their DNA structure, asked that Rich review their work and corroborate their ideas. Collagen model built by Alexander Rich and Francis Crick. September 1955. In the wake of Watson and Crick’s triumph, the structure of nucleic acids continued to intrigue Rich. This time around however, it was RNA that caught his attention. Like DNA, RNA carries genetic material and is vital to the formation of proteins. It is thus necessary to understand the structure and function of RNA to fully comprehend DNA’s role in protein formation. Rich began research in this area during James Watson’s brief stay at Caltech, and some now speculate that Rich’s interest in RNA images led Watson to focus entirely on RNA. While in Pasadena, Rich and Watson collected different images of RNA in an attempt to understand its physical structure, but the x-ray crystallographic photographs available at the time were not sufficient enough to discern a conclusive model. Rich’s stint at Caltech came to an end in 1954 and he subsequently moved into his own laboratory at the National Institute of Mental Health (NIMH). While there he continued to delve into questions regarding the structure and composition of RNA. At the NIMH Rich was, at long last, successful in creating an image of RNA that provided hints about its structure. Rich concluded that RNA consists of a single-stranded nucleic acid that binds with complementary strands of RNA to form a temporary double helix – a process he described as molecular hybridization. Many were skeptical that a single-stranded nucleic acid could temporarily form a double helix, but Rich was able to show that this is made possible by the shedding of water molecules that comes about when the two strands bind. Not only did this finding contribute enormously to the understanding of RNA’s structure and function, but Rich’s contributions to the understanding of molecular hybridization in nucleic acids has opened up many more possibilities. For example, polymerase chain reaction, a process used to identify genes, is based on the principle of hybridization. Today, methods of this sort are fundamental to all sorts of work in biotechnology and to the analysis of DNA. 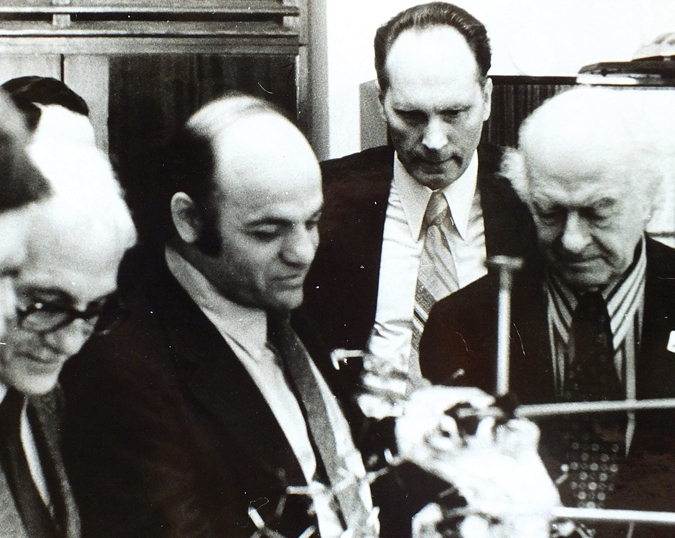 Alexander Rich with Linus Pauling, among others, at a scientific meeting in the Soviet Union. Image Source: Alexander Rich Collection. Following his tenure at the NIMH, Rich became a professor of Biophysics at the Massachusetts Institute of Technology, beginning in 1958 and lasting until his death. His investigations there included the discovery of Z-DNA, which is a type of DNA molecule that takes a zigzag form and follows a left-handed wind rather than the more common right-handed wind. His work at MIT also showed that protein synthesis occurs in a polysome – the name given to a cluster of Ribosomes that work together. 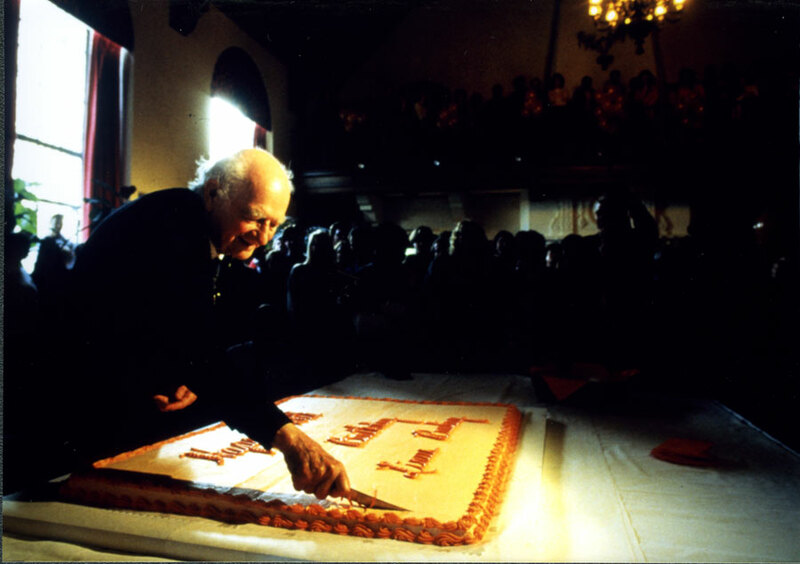 Today is Linus Pauling’s birthday – he would have been 112 years old. Every year on February 28th we try to do something special and this time around we’re pleased to announce a project about which we’re all very excited: the sixth in our series of Pauling documentary history websites. Launched today, Linus Pauling and the Structure of Proteins is the both latest in the documentary history series and our first since 2010’s The Scientific War Work of Linus C. Pauling. (we’ve been a little busy these past few years) Like Pauling’s program of proteins research, the new website is sprawling and multi-faceted. It features well over 200 letters and manuscripts, as well as the usual array of photographs, papers, audio and video that users of our sites have come to expect. A total of more than 400 primary source materials illustrate and provide depth to the site’s 45-page Narrative, which was written by Pauling biographer Thomas Hager. That narrative tells a remarkable story that was central to many of the twentieth century’s great breakthroughs in molecular biology. Readers will, for example, learn much of Pauling’s many interactions with Warren Weaver and the Rockefeller Foundation, the organization whose interest in the “science of life” helped prompt Pauling away from his early successes on the structure of crystals in favor of investigations into biological topics. So too will users learn about Pauling’s sometimes caustic confrontations with Dorothy Wrinch, whose cyclol theory of protein structure was a source of intense objection for Pauling and his colleague, Carl Niemann. Speaking of colleagues, the website also delves into the fruitful collaboration enjoyed between Pauling and his Caltech co-worker, Robert Corey. The controversy surrounding Pauling’s interactions with another associate, Herman Branson, are also explored on the proteins website. Linus Pauling shaking hands with Peter Lehman in front of two models of the alpha-helix. 1950s. Illustration of the antibody-antigen framework, 1948. Many more discoveries lie in waiting for those interested in the history of molecular biology: the invention of the ultracentrifuge by The Svedberg; Pauling’s long dalliance with a theory of antibodies; his hugely important concept of biological specificity; and the contested notion of coiled-coils, an episode that once again pit Pauling versus Francis Crick. Linus Pauling and the Structure of Proteins constitutes a major addition to the Pauling canon. It is an enormously rich resource that will suit the needs of many types of researchers, students and educators. It is, in short, a fitting birthday present for history’s only recipient of two unshared Nobel Prizes. -James Watson, letter to Max Delbrück, February 20, 1953. We were very interested to see that a model of the Pauling-Corey “triple helix” structure of DNA has been built by Farooq Hussain. As Hussain notes on his website, the model was constructed based on drawings published by Linus Pauling and Robert Corey in their paper detailing the incorrect structure. The proposed triple helix structure of DNA. Model by Farooq Hussain. Hussain’s representation of the triple helix is striking; especially so when compared with Watson and Crick’s far more elegant and intuitive double helix, surely the most famous molecule in history. 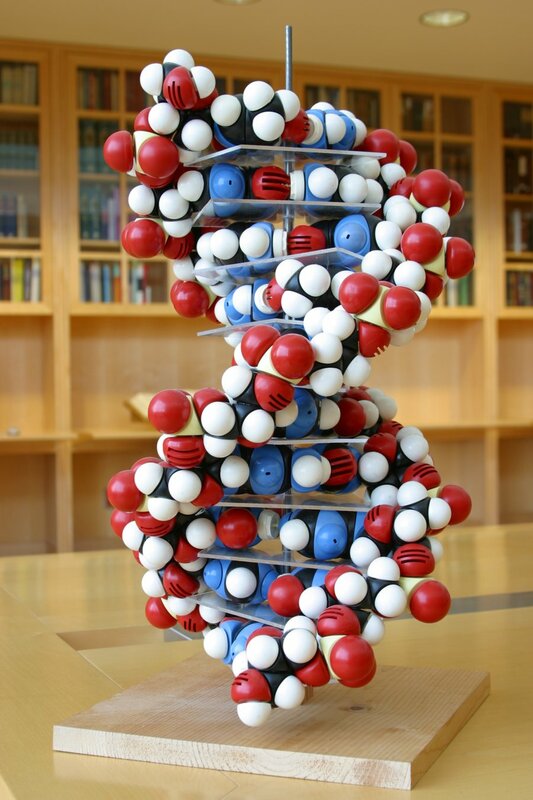 Double helix model, courtesy of P. Shing Ho. For more on the triple helix, see our write-up on the subject, published in April 2009. Pastel depiction of the DNA base pairs by Roger Hayward. The solving of the double helix structure of DNA is now considered to be one of the most important discoveries in modern scientific history. The structure itself suggested a possible mechanism for its own replication, and it also opened up a huge window of opportunity for advances in multiple fields ranging from biology to genetics to biochemistry to medicine. Almost immediately after James Watson and Francis Crick announced their structure, new research began based on the structure’s specifications. The Pauling Papers contain an interesting example of research done on the structure of DNA mere months after its discovery. On October 22, 1953, the Russian-born physicist (and founder of the “RNA Tie Club“) George Gamow sent a letter to Linus Pauling that mentioned some work he had been doing with DNA. 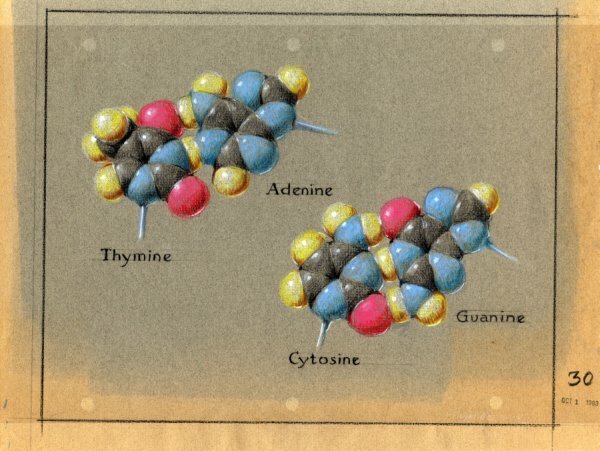 Gamow explained that he had found a manner by which the twenty amino acids that make up proteins could be related to different combinations of the four nucleotides found in DNA. At this time, it wasn’t known that the DNA strands unwind during replication, and Gamow assumed that protein synthesis occurred directly on the double helix. He suggested that a “lock and key relationship” might exist between each amino acid and that the “holes” formed between each complementary base pair in the DNA chain. Science is now aware that this is not the case, but Gamow’s letter is nicely demonstrative of the innovative research ushered in by Watson and Crick’s solving of DNA. Excerpt from Gamow's letter to Pauling, October 22, 1953. Click here to view Gamow’s entire letter, and here to read Pauling’s response. As the buzz around DNA started to die down, scientists began to move toward the next logical step: RNA. By then, Watson and Crick’s structure was widely accepted, and it had been clear for some time that DNA was the site of the gene. So, then, how did DNA transfer its information to RNA, and finally on to proteins? Gamow’s above suggestion was a possibility, but it didn’t even involve RNA. Watson spent some time playing with the matter, but was not able to equal his luck with DNA. Unfortunately, it would be quite some time before this mechanism was elucidated. Even now, some of the finer details of how this is accomplished are not completely understood. 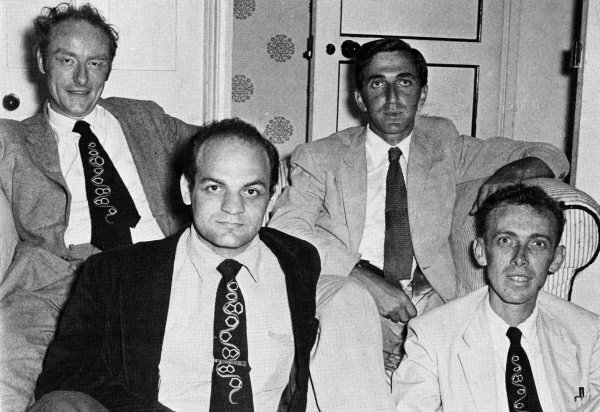 Four members of the RNA Tie Club, 1955. Clockwise from upper left: Francis Crick, Leslie Orgel, James Watson and Alexander Rich. Founded by George Gamow, the RNA Tie Club met twice a year in pursuit of greater understanding of RNA. Unsurprisingly, as time went on, Watson and Crick began to accumulate awards for their work with DNA. On December 15, 1959, Linus Pauling responded to a previous letter sent to him by Sir William Lawrence Bragg soliciting Pauling’s support of the nomination of Watson and Crick for the Nobel Prize. In this letter, Pauling stated that he would indeed be willing to write the requested letter of support. However, contrary to Bragg’s suggestion that they be nominated for the prize in chemistry, Pauling stated his belief that a prize in physiology or medicine would be much more fitting. Several months later, on March 15, 1960, Pauling finally sent his letter to the Nobel Committee. By the time of its authorship, Pauling’s feelings about the importance of Watson and Crick’s work had become even more tepid. In the end, Pauling couldn’t bring himself to go through with the promised nomination. 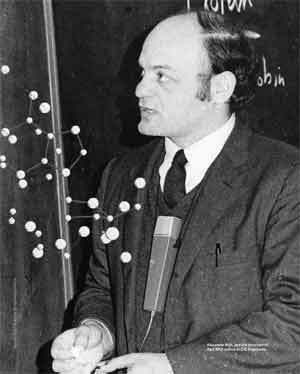 It is my opinion that the present knowledge of the structure of polypeptide chains in proteins is such as to justify the award of a Nobel Prize in this field in the near future, to Robert B. Corey for his fundamental investigations of the detailed molecular structure of amino acids and the polypeptide chains of proteins or possibly divided between him and Kendrew and Perutz. On the other hand, I think that it might well be premature to make an award of a Prize to Watson and Crick, because of existing uncertainty about the detailed structure of nucleic acid. I myself feel that it is likely that the general nature of the Watson-Crick structure is correct, but that there is doubt about details. The discovery of the structure of DNA was clearly one of the most important discoveries in the modern scientific era. Not only was it a huge breakthrough in itself, but it also opened the door for major advances in numerous other science-related fields. For more information on DNA, check out the rest of the posts in our DNA series or the website on which they are based, “Linus Pauling and the Race for DNA: A Documentary History.” For more information related to Linus Pauling, please visit the Linus Pauling Online portal.